A quality deck brings a lot of benefits to a home. It can boost your property values, give you a dedicated space for entertaining and relaxing outdoors, and improve the look and feel of your home and yard. But which material is the best for a new deck: vinyl or wood? Keep reading to learn more about each and which one is right for you. Up until the last 20 years or so, wood was the only viable material for a long-lasting deck. Today, wood still has some benefits and features many customers like. For instance, wood decks are quick and easy to install, and when they are built with treated lumber they are relatively durable. You can also easily paint or stain a wood deck to match your home. However, wood decks also have a few drawbacks you’ll want to consider. First, wood decks don’t last forever, and need a lot of upkeep to stay in good shape. Most wood decks need to be treated and stained regularly to avoid fading, splintering, and damage. They can also be harder to keep clean since wood absorbs dirt and stains. Finally, wood is vulnerable to damage from pests, insects, mold, and mildew. If you do choose wood for your deck, expect to replace it in 5 to 15 years unless you use an exotic (and expensive) hardwood. Also remember to budget for regular treatment and paint or stain to keep it looking good. In contrast to wood decks, vinyl and composite decking is a relatively new product that many homeowners aren’t familiar with. Also unlike wood decks, manufacturers of vinyl decks have made many improvements to the materials since they started offering them. Today’s vinyl decks are extremely strong, durable, and long-lasting products. Some people have criticized vinyl decks for problems such as becoming brittle in cold weather, fading in harsh sun, and chalking over time. However, newer formulations of vinyl prevent these problems in new decks. A vinyl deck built today will remain strong through the harshest heat and cold, and will retain its color and good looks for decades. It is true that vinyl decks can’t be refinished, but modern vinyl decks are built to be easy to repair. The pieces are almost all modular and easy to remove and install, so if you do ever damage your deck it won’t be hard to fix it again. Appearance – Both wood and vinyl decks are beautiful, but only vinyl will keep its looks for decades after you build it. Maintenance – Wood decks require maintenance such as sealing and staining. In contrast, a vinyl deck is virtually maintenance free after it is built. Lifespan – Vinyl decks can last for decades. Wood decks need to be rebuilt or replaced after 5 or 15 years at most. Price – If you’re on a limited budget, a wood deck can be built from relatively inexpensive lumber (but don’t expect it to last very long). Vinyl decks are pricier but will last as long as the toughest hardwood. Ready to learn more about your decking options? Contact us today at Future Outdoors. We offer the best prices and the most options for vinyl decks in the Dallas metro area. 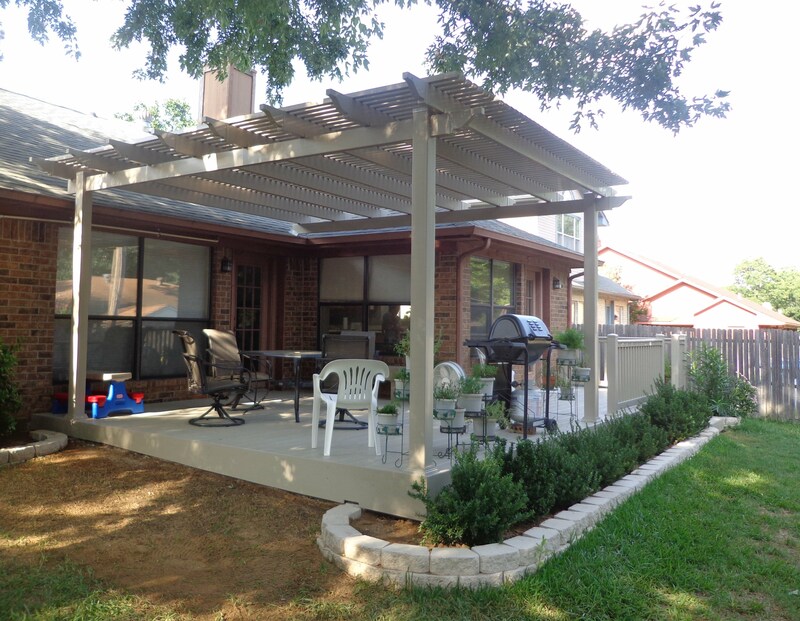 Call 972-576-1600 today to schedule your free, no-obligation quote, or visit us on Facebook to see pictures of past jobs and read reviews from other satisfied customers.